Nine months on the market with no activity... we listed it... did this web page... got it on page 1 of Google "Bonsall Home for Sale".... had Three Offers... and the buyer from Scottsdale drove over ... specifically to see this one home... after finding it on Realtor.com... and following the links to this web site. Spectacular Marketing will always get Spectacular Results... in this market... you can't imagine the difference. This Seller can tell you! 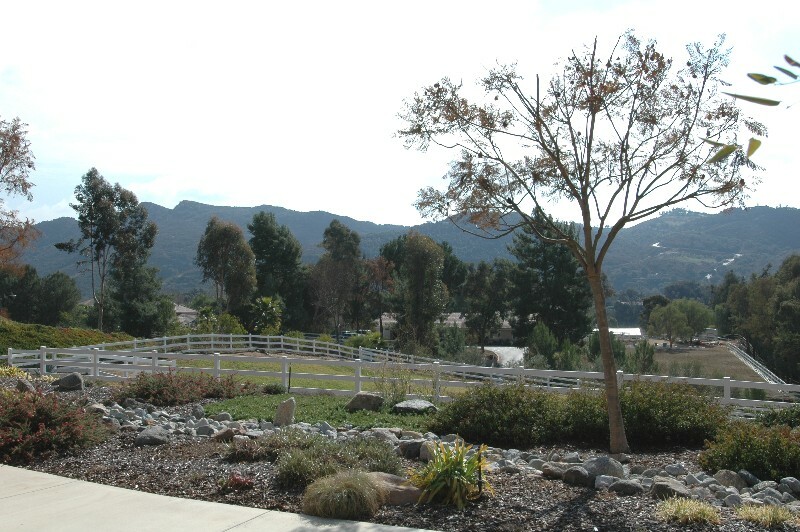 This is Saratoga Estates... one of Southern California's Premiere Equestrian Communities... sitting right in the middle of Beautiful Bonsall California. The old adage of Location... Location... 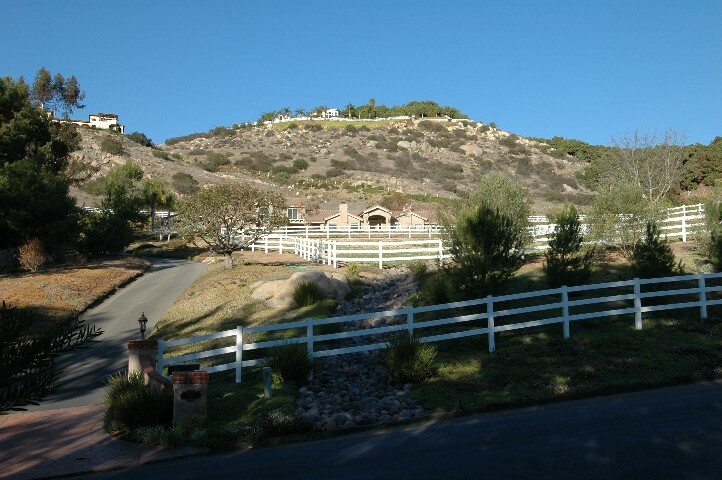 Location... has never been more true than with this Spectacular Bonsall Home for Sale! 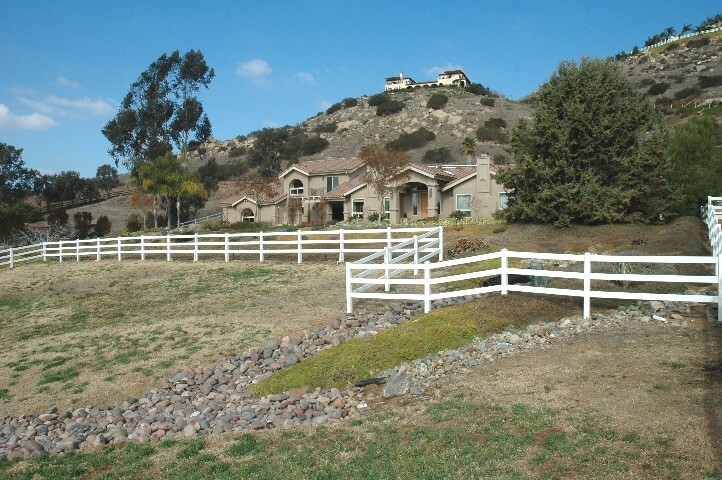 The gated estate community offers miles of dedicated horse trails and this particular home has wonderful horse improvements including irrigated fenced pasture... turnout arena... shed row barn... and a flat useable... yet view 2.42 Acre secluded lot. 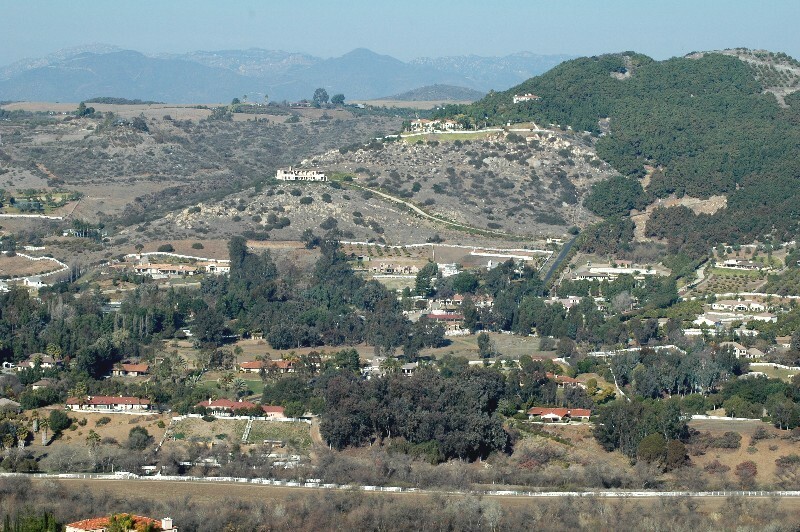 Whether you own a horse or not... this is one of San Diego's finest communities... and the life experience will be paradise. The home... a truly incredible re-build of a wonderful 1985 custom home... creating a "Better than New" residence... built to a standard seldom found. In the view above, shot from across Moosa Canyon in Hialeah Estates... you can see our treasure in the center of the photo... tucked into the hillside on the quiet back side of Saratoga Estates... with the barn and Grove nestled behind the rambling elegant residence. Gated... quiet Saratoga Estates has Only three Private Roads... two courts... and Via Mariposa... so upon entering... you have a simple choice of shortcut... left for Norte... right for Sur... but either direction will get you to 7102 Via Mariposa Norte... and if paradise had an address... this might be it. Easy access to I-15 by way of Camino Del Rey... but tucked into the back of the community in one of their most quiet settings. Noise Pollution her will be pesky crows... Red-tailed Hawks... and Barn Owls at night. 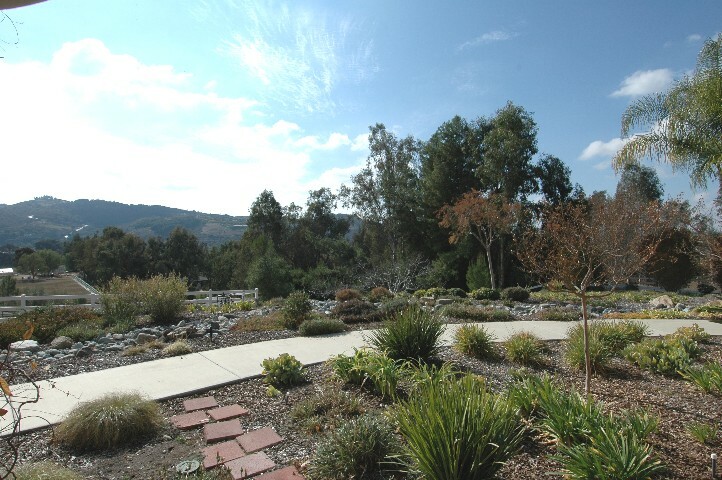 Secure gated access, private roads and two Acre Minimum parcels insure the enjoyment of nature... solitude... and serenity... attributes hard to find in Southern California today. Not only has this entire home been lovingly re-built... all of the horse improvements are new as well. Beautiful Low maintenance Vinyl Pasture fencing... new irrigation for the pasture and dust control of the turnout arena... and you'll notice this is mature established landscaping. San Luis Rey Golf and Tennis is just down the street... with fun to be had... and a great casual restaurant... with excellent food and atmosphere. If there is one single attribute most difficult to find in Southern California today... it would be "Quiet". Well this is what quiet looks like... this is the place to hide from the rest of the world. 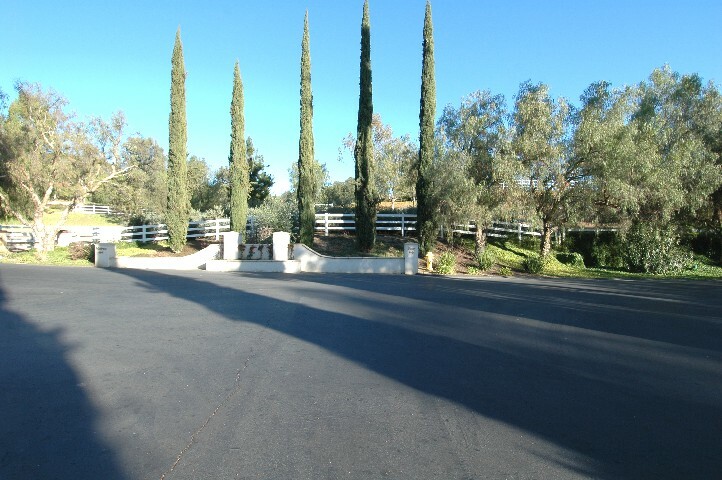 As soon as you enter Saratoga Estates... you know it is special. As soon as you arrive at the drive entrance... you know the home is special. This was a nicely built custom home in 1985. When the current owners bought it in 1999... it was dated... dark... and is a state of disrepair. This was not re-done to make a profit... so no expense was spared in creating a "New" Dream Home. Situations change... and the current owners have relocated out of state... and here is an incredibly opportunity. 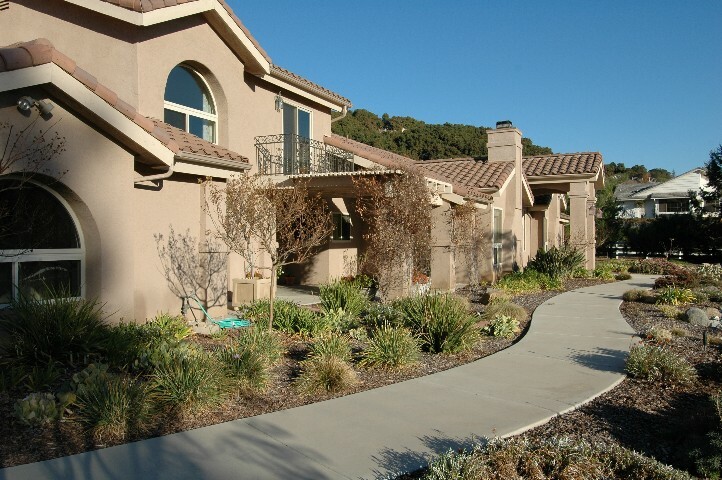 If you bought a 1985 fixer anywhere in Bonsall.. Fallbrook... or Vista... at today's market price... you could not re-build to this standard within hundreds of thousands of dollars... of what this home is going to sell for. This owner bought the home... and completely re-built it... and now you can buy it for less than replacement cost! On these outside views... notice the new roof... notice the new Stucco... notice the new windows... the new hardscape... new landscape... the new drive... the new fencing... the new irrigation... it just goes on and on. When you look close... the design thought and quality will speak for itself. Panoramic Views... don't usually go along with "Flat and Useable Space"... but here they do. The lot is on a gentle hillside on the back of Saratoga... above Moosa Creek... and has a wonderful Southern Exposure... across the Pasture in front... over the neighboring equestrian estates... to the hills of Hialeah beyond. This is 15 miles from the Oceanside Pier... and it is by Sunset Magazine's description... the "favored climate in the United States for raising sub tropical plants"... Zone 23 Weather Paradise. But... every home in sight in these photos share that weather... a few lucky ones share Saratoga Estates... and the dedicated riding trails... but seldom will you find a home... re-built... with this attention to detail... and choice of top of the line materials. So... click on the next link to see the next page... and learn more.